I knew that many of our Founding Fathers were Free Masons. I had learned that from the history books as well as a few modern movies. But I had never known you could see inside a Masonic Temple. While searching online for things to do in Philadelphia I found “Masonic Temple” high on the To-Do list. We weren’t sure what to expect. We were aware of the level of secrecy surrounding the Masons so we were a bit apprehensive to visit but our curiosity got the best of us and Tammy and I quickly signed up for a tour. We were blown away at the majesty and ornateness from the walls to the furnishings to the tapestries and tile work. It was far more than I expected. There are seven huge “halls” used as meeting rooms. We were surprised to find that each hall had a completely different design and décor. 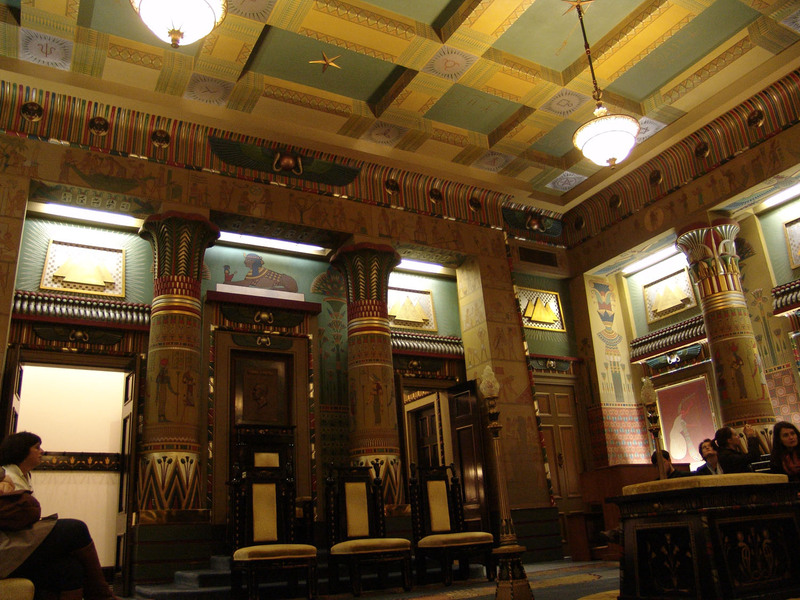 The seven halls were: Oriental, Gothic, Ionic, Egyptian, Norman, Renaissance, and Corinthian. While in each one we felt like we were swept away to Egypt or Greece or medieval Britain. It didn’t feel like we were in the US at all. library, majestic staircases and many other rooms. Even the hallways were gigantic with priceless workmanship. We were given time to look around the museum and read from a few books. We found some of George Washington’s Masonic belongings in the museum. During the tour you are taken up, around, and through most of the building. In each hall you are seated and the guide talks about the architecture and answers some basic questions regarding the history of Masonry and the reasons for their meetings. Tammy and I both amazed by the charities that have benefited from Masonic temples around the world. We learned about the different lodges and the difference between the US and some European groups. Now, the tour didn’t discuss anything secret and our tour guide would let us know if we had asked something he couldn’t reveal. But there was still plenty to talk about. We certainly felt more educated after the tour. Although the Masons are founded upon Faith, we didn’t feel any part of the tour was preachy. They do charge about $10 for adults. They do allow younger children on the tour and we wish we could have brought the kids. We felt like even 5 year old Parker would have loved the architecture although he might have gotten bored during the sitting and talking parts. The museum has some older items that little hands might want to touch but most things are behind glass display cases. Here are some more photos from our adventure.